One morning last winter in Banff, I returned from the breakfast buffet at my hotel with a mountain of rosemary-roasted potatoes on my plate, prompting my travel mate to quip: “Are you going to eat that or climb it?” He had a point, but in my defense I did have to fuel up for a day of outdoor adventure. 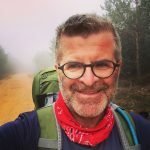 That’s how I rock in the Rockies: I typically load up on a hefty breakfast of carbs and protein in the morning, then burn it all off on a hiking trail or strapped into snowshoes or skis (depending on the season) and end my day with a martini or a massage (often both) back at my hotel. If you follow this same philosophy, these 10 Banff hotels serve up breakfast to suit every budget, taste and appetite, whether you’re planning a day of skiing, hiking, sightseeing or shopping. 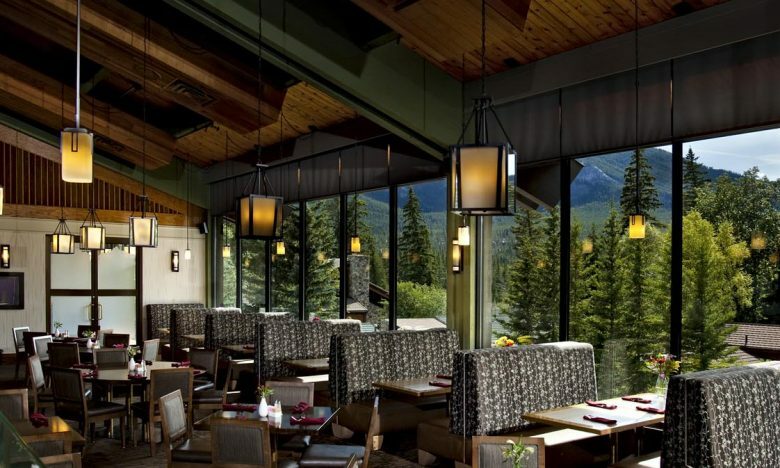 Just try to focus on the breakfast menu upon taking your seat at Crave Mountain Grill at the Banff Park Lodge—it is easy to be distracted by the stunning mountain views. A buffet is available, but chances are you’ll be tempted by the breakfast meal items on the menu. Let’s start with the Banana Bread French Toast, which is dressed up with bananas, strawberries and caramel sauce. The Healthy Start breakfast will certainly tickle your fancy: the house-made Bircher muesli comes with fresh cut fruit, a muffin and a shot of freshly-juiced carrot ginger nectar. The Crave Breakfast Burger plants a house-made Italian sausage patty on a toasted artisan bun with arugula, tomato and breakfast potato. The Tuna Crudo Breakfast Bowl promises British Columbia line-caught, seared rare Albacore tuna with crispy potato cakes, avocado, a free-run poached egg and a drizzle of wasabi. And, in a nod to one of the largest cultural groups in Alberta, there’s the Ukrainian Breakfast: feta-stuffed perogies with a Burnbrae poached egg, caramelized onions, hand-pinched spinach, bacon, nacho cheese and sour cream. Bonus: The popular Sunday brunch serves hot (carved rib-eye of Alberta beef) and cold (smoked salmon) items. Breakfast starts at: 7 a.m. If you’re an avid hiker, item number three at The Evergreen Restaurant and Lounge at Delta Hotels Banff Royal Canadian Lodge will leap off the menu: The Healthy Hiker’s Breakfast includes fresh fruit salad, scrambled eggs, multigrain toast and, in keeping with their commitment to use organic Alberta-produced foods whenever possible, yogurt from the award-winning Bles-Wold Dairy in Lacombe, Alberta. If you’re gunning for a full on meat-lover’s start to the day, it’s a no-brainer: Steak and Eggs features a charbroiled six-ounce Alberta AAA prime sirloin cut with all the fixings. Other signature breakfast options include the Mountain Sunrise Omelet (red peppers, mushrooms, tomatoes, green onions, ham and cheese and savory wedge potatoes on the side), which will give you enough fuel to hit the slopes multiple times. 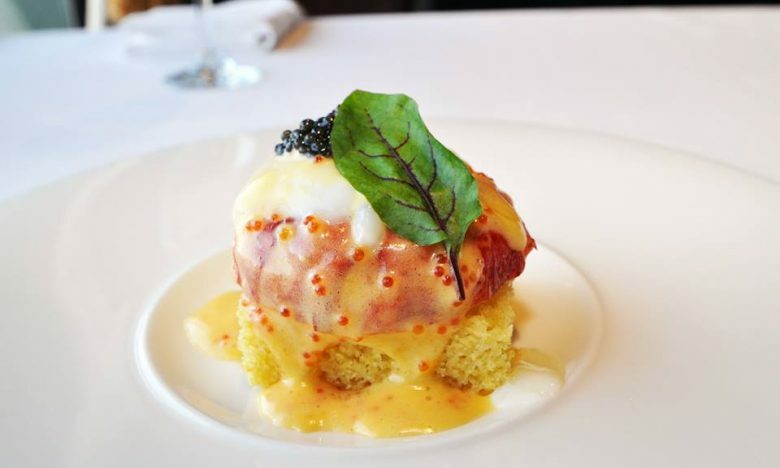 For non-beef-eaters, Pacific Benedict highlights wild smoked Pacific salmon. Vegetarian options are also available. Bonus: Keen on a breakfast meal that’s not on the menu? Just ask the staff. Breakfast starts at: 6:30 a.m. If you take an early morning walk outside the Juniper Hotel chances are you’ll see elk on the horizon—and happily not on the menu at the Juniper Bistro. Diners who follow a gluten-free or vegetarian diet will love this breakfast menu, as will meat-eaters who can opt for braised rabbit or pork belly to start their day in Banff. If you feel that avocado toast has overdone its welcome on breakfast menus around the world, think again. The Grilled Avocado on the Juniper breakfast menu is made with charred corn, crumbled feta, poached egg and oven-dried tomatoes on sourdough. If you’re still sated from the previous night’s dinner and want a lighter morning meal, opt for the Brekky Salad: tossed kale, seasonal greens and herbs, lemon vinaigrette, two poached eggs, award-winning Noble Meadow Farms goat cheese and candied nuts. When you’re booked into a day of snowshoeing up on Sunshine Meadows, the certified Angus beef and Applewood-smoked cheddar on brioche bun in the Juniper Burger should give you enough calories, especially as it comes with a side order of brown butter hash. Other hefty options include Pulled Pork Poutine (enough said!) and, when it’s time to pull out the big guns at breakfast, there’s Steak and Eggs—which get an added kick from the red pepper relish. And for a breakfast item a little different, tuck into the Juniper Benny, which marries bannock with braised rabbit, poached eggs, hollandaise and buffalo mozzarella under a juniper berry glaze. Bonus one: Gluten-free and vegetarian options are available for every meal on the menu. 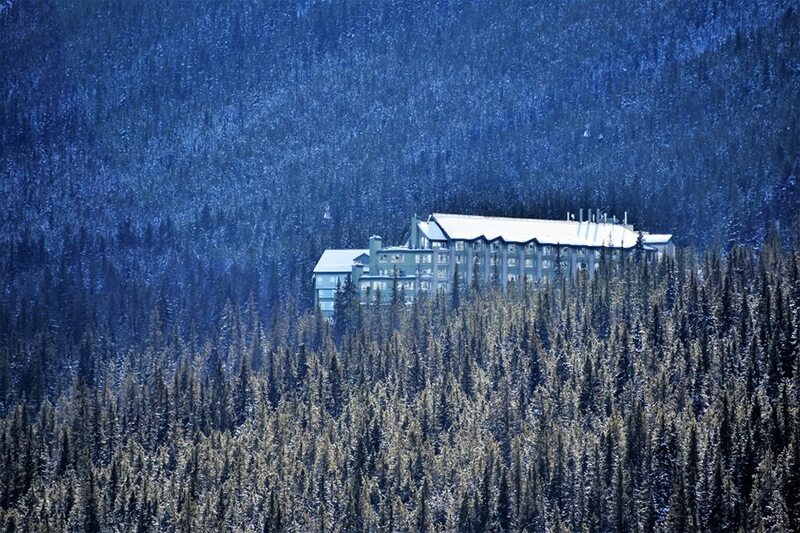 Bonus two: The wall-to-wall glass guarantees stunning views of Banff National Park while you chow down. We’ll fess up–we were flagrantly seduced by the red and purple potato hash on The Primrose’s menu at The Rimrock Resort Hotel. The colorful tubers are among the locally-sourced ingredients from Alberta (and some from British Columbia) that dominate the breakfast menu. The kitchen serves up traditional morning favorites, but with a twist: Crab Cake Benedict, West Coast Croque Madame, Avocado French Toast… But go for a signature Primrose breakfast dish: AAA Alberta beef tenderloin tips are the star ingredient in the Beef Tenderloin Flatbread Plate, which is served with caramelized shallots, arugula, Canadian goat cheese, coddled eggs (from a local farm) and black pepper béarnaise. The Rocky Mountain Breakfast Paella gets inventive with grilled garden vegetables, forest mushrooms, spring onions, sun-cured tomato, poached farm-fresh eggs, red and purple potato hash (which you must try!) and burrata cheese. The kitchen staff amp up the flavor in the Rocky Mountain Hash by introducing rosemary béarnaise and chorizo to the bacon, sausage, forest mushrooms, spring onions, eggs and grilled tomato creation. Bonus: Rimrock Resort Hotel is on Mount Sulphur so you’re just steps away from the iconic Banff Gondola and Banff Upper Hot Springs. The iconic Fairmont Banff Springs hotel always inspires us to channel our inner Eloise—you know, that storybook character who lived in another Fairmont hotel. The property offers enough activities (from spa treatments to live music to onsite neon black-light bowling) that guests really never need to leave the property. The same applies to dining options. There are no fewer than 10 eateries (and drinking venues) in this castle-like hotel. But let’s talk about STOCK Food & Drink on the main floor of the hotel as one of our two favorite breakfast options (other than the indulgent room service, of course). The dining area at STOCK, where diners help themselves at the counter, feels like an upscale, hipster-friendly shared workspace, with large tables equipped with outlets to recharge your gizmos before heading out. 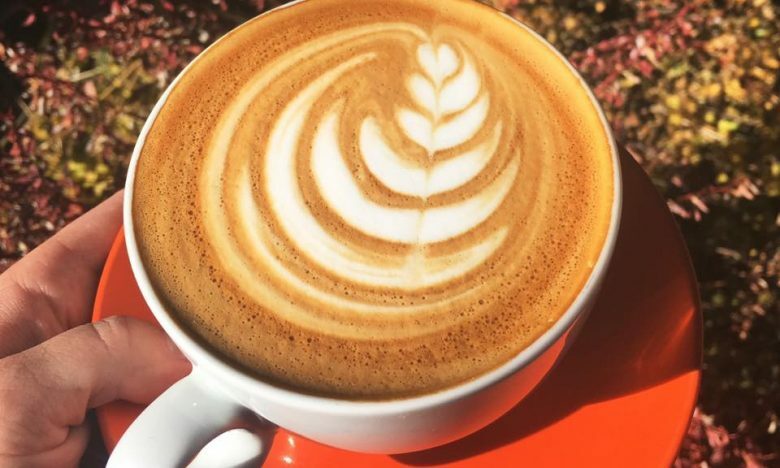 The menu focuses on house-made, artisanal food: egg and toast soldiers, granola, avocado toast, mushroom quiche and assorted breakfast sandwiches, smoothies—and stellar coffee. Bonus: STOCK uses fresh herbs grown year-round in its very own herb garden, within sight of the cash register. For a less rustic, more elegant breakfast experience, nothing competes with the Fairmont Banff Springs’ onsite French brasserie, the elegant Vermillion Room. If you’re going to linger over breakfast, this is your spot. There’s no question that the kitchen fusses over the breakfast meals. The smoked steelhead trout in the Oeufs Bénédictine is cooked to perfection (feel free to swap in house pea meal bacon should you wish). Muesli gets a nod for the addition of chia seeds to the toasted oats, Greek yogurt and mix of dried fruit and nuts. And since you’re waking up in Canada’s very first national park (Banff National Park was established in 1885), go Canadian all the way and include signature maple syrup in your breakfast by ordering Pain Perdu, which includes egg-dipped brioche, seasonal compote and maple syrup. 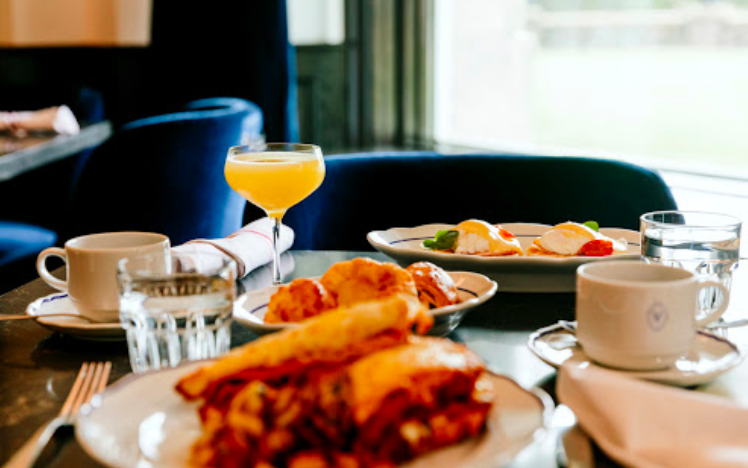 Bonus: If you desire, as Maggie Smith’s dowager countess from Downton Abbey would say, “a lie-in at the weekend,” note that guests can enjoy brunch (with mimosas) in the Vermillion Room Saturday and Sunday from 11 a.m. to 3 p.m. The Whitebark Café at the Banff Aspen Lodge is ideal when you wake up to discover that 10 inches of powder have fallen during the night and all you want to do is get to those slopes ASAP. 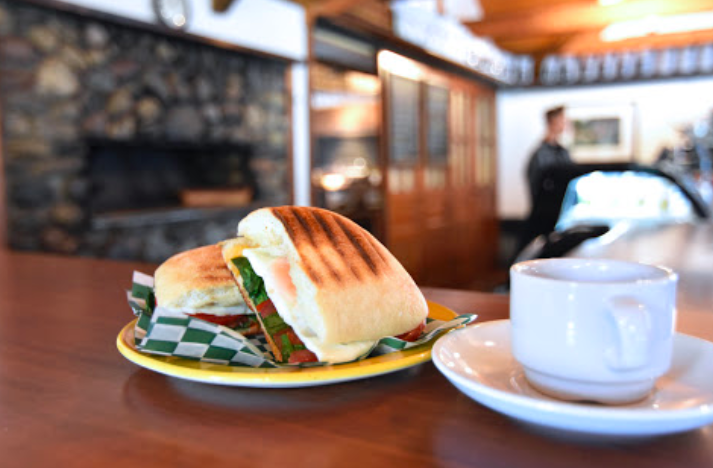 At Whitebark Café, you can fuel up on a quick, no-nonsense breakfast, inject good java into your veins and hopefully beat other guests to the ski slopes. The yogurt parfait, made with house-made granola and fruit compote, is paired with a homemade muffin or scone. And great coffee rules here. Its fair-trade, organic Moja Coffee from North Vancouver has been known to lure non-guests to stop by on their way to the chair lift. For non-coffee drinkers, there’s premium loose-leaf tea supplied by the Banff Tea Company. 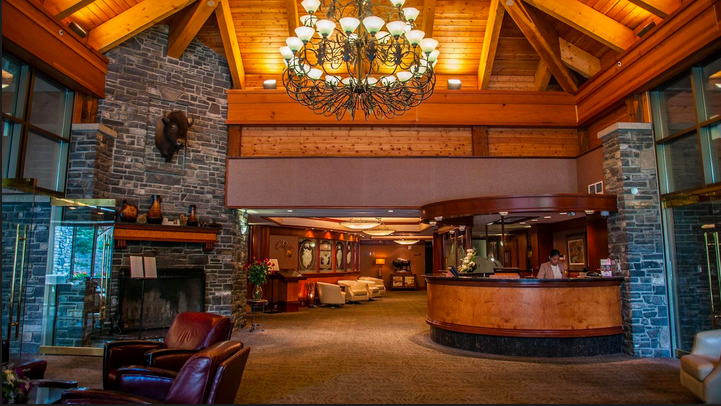 Bonus: The Banff Aspen Lodge donates $4 on behalf of every guest to the Banff Community Foundation, which supports local environmental initiatives. 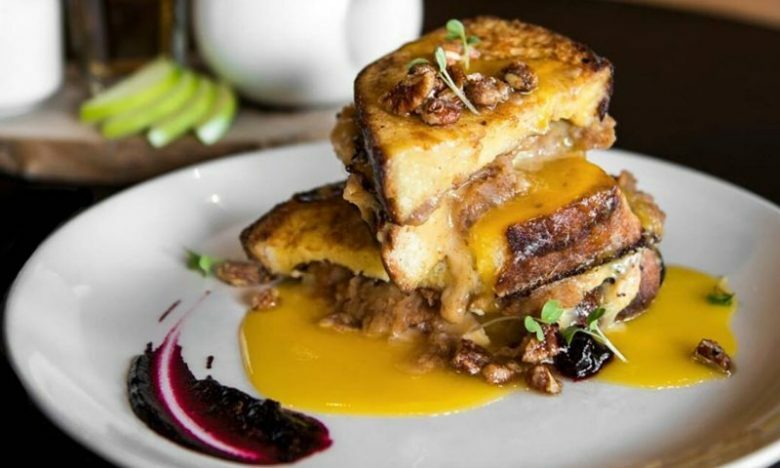 The 30-minute car ride through Banff National Park to the Baker Creek Bistro at the Baker Creek Mountain Resort is a small sacrifice in order to enjoy breakfast created by executive chef Collin Rogers. Chef Collin previously worked at the James Beard House in New York and Maple Bistro in Halifax, where he cooked under the tutelage of Chef Michael Smith of Food Network fame. You’ll likely struggle to choose between the Truffle Mushroom Benny (wild mushrooms, Grana Padano cheese, poached eggs, truffle oil and micro greens) and the Baker Creek Breakfast Wrap (in which free-range eggs are elevated with the addition of smoked bacon, Pico de Gallo salsa and avocado). 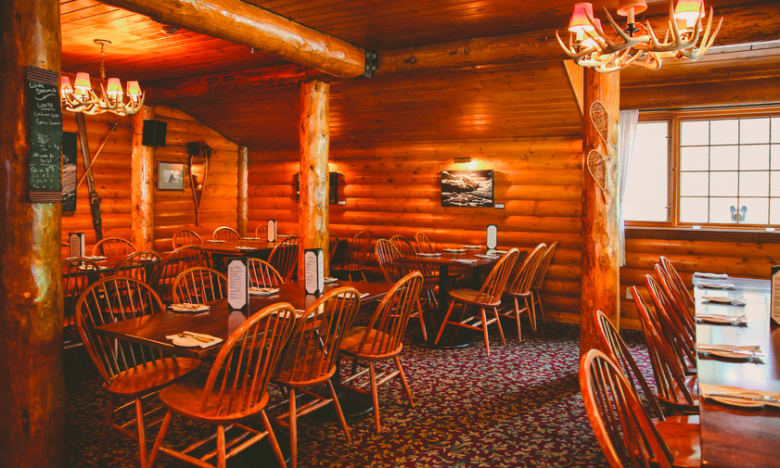 Bonus: The bistro is located in a rustic log cabin on the hotel property. The ranch to restaurant inspired menu of the refurbished Sleeping Buffalo Dining Room at the Buffalo Mountain Lodge offers lots of smoked, cured and roasted wild game, organic root vegetables, mushrooms, mixed grains, fresh indigenous berries and assorted wild fruits. All game meats are sourced from the restaurant’s family-owned Canadian Rocky Mountain Ranch (CRMR), which is set on 220 hectares in the rolling foothills of Calgary. The culinary ethos? CRMR’s family of hotels eschew hormones and antibiotics in the food they serve. Sustainability rules! 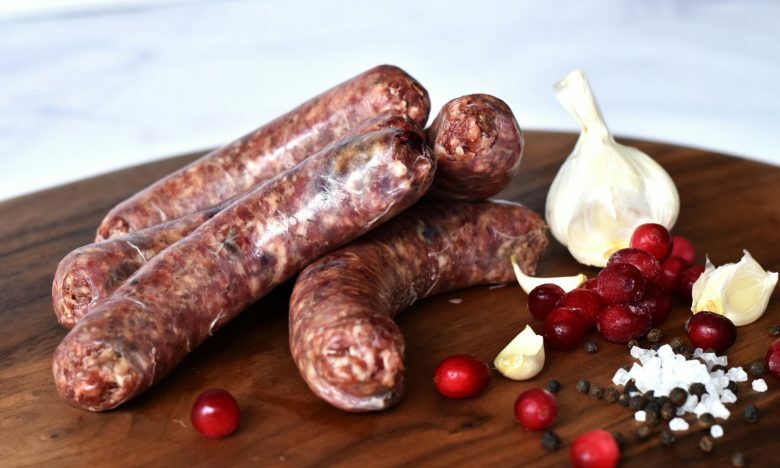 With that in mind, consider Elk Cranberry Sausage, Mixed Grill and Game Hash (elk and bison), Brioche French Toast or Grilled Asparagus Omelet. (Gluten-free options are available as well). Bonus: Guests can purchase hormone-free foods to take home by purchasing online. The CRMR’s Buffalo Mountain Café, also on the Buffalo Mountain Lodge property, merits its own entry. The rustic café is just a short walk from the main lodge and it’s ideal for anyone who wants a fairly quick—but delicious—breakfast before heading out for the day. The star of the menu is the Truffle Bacon Grilled Cheese, which pairs perfectly with a mug of organically grown, fairly traded Rebel Bean Coffee, roasted fresh every week at a small batch coffee roaster in Okotoks, Alberta. There’s also a selection of fresh pastries, muffins, homemade desserts and sandwiches if you wish to grab an energizing snack to nosh on later. Bonus: Nothing beats an al fresco breakfast on the outdoor patio in warmer months. Mountain air and a cuppa java—who needs vitamin supplements. 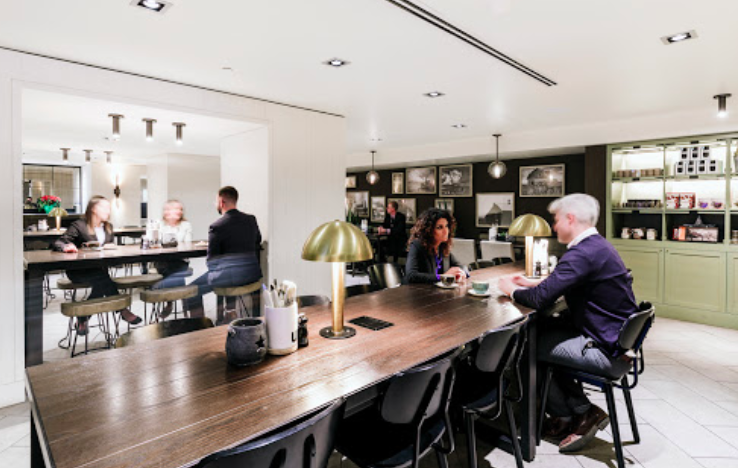 For other hotel dining options, see our story on noshing at airport hotels!